Enjoy an age defying, healthier, more youthful appearance with the revolutionary LED technology. The Bio-Synthesis light activated rejuvenation system utilises high intensity light emitting diodes (LED’s) which allow your skin therapist to quickly create customised LED services to address your specific skin concerns. 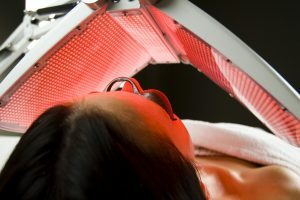 Clinically proven LED light therapy is known to be effective for a wide range of application, including skin rejuvenation, acne reduction, hyperpigmentation and skin detoxification. The Bio-Synthesis LED treatment incorporates over 4000 individual lights and advanced Chromatic skin care system to stimulate collagen synthesis and to reduce acne and hyperpigmentation to promote firmer skin and a more even skin tone. The Bio-Synthesis light activated rejuvenation system is a non-invasive, comfortable treatment resulting in exceptional improvement to the appearance of your skin. The Bio-Synthessis light activated rejuvenation treatment is safe for all skin types and colours. The Bio-Synthesis facial applications are convenient and hands free. The device features an intelligently designed 6 way adjustable panel and more than 4,000 individual lights that provide maximum and consistent coverage of the face, neck and décolletage. You can immediately resume your normal daily activities after treatment. With Bio-Synthesis light activated rejuvenation system, you can often feel and see results after the first treatment. Bio-Synthesis increases collagen synthesis, reduces hyperpigmentation, detoxifies and reduces acne resulting in a firmer, healthier, clearer, more youthful appearance to your skin.